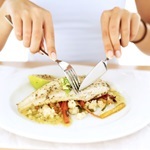 Home » Pain » The Food That Slashes Your Arthritis Risk by 50%! It has been known for some time that your diet can help manage and in some cases help decrease the effects of disease on your body. However, recent evidence may show us that your diet can actually prevent some types of arthritis from occurring. The results of the study indicated that the women who consumed at least one serving of fatty fish per week for the 10-year study period had developed rheumatoid arthritis at half the rate as participants who ate little or no fish at all. Consistent intake of one or more servings per week of any type of fish over the entire study period was associated with a reduced risk of 29% compared to less than one serving per week of fish! The results of this study were significant after variables such as smoking, age, alcohol intake, and the use of aspirin were considered. Previous recommendations were that people consume at least two servings of fish or shellfish every week for the additional health benefits. “This study is an additional argument to follow that recommendation and to make one of those servings fatty fish,” says study author Dr. Alicja Wolk, Professor of Nutritional Epidemiology at the Karolinska Institute in Stockholm, Sweden. In my opinion, depending upon your current health status, two to four servings of oily fish per week is required to have the full benefit that this wonderful food can provide. Fish and seafood, whether it’s oily or not, is a great source of protein, trace minerals, and essential fats. The oily varieties of fish like salmon, mackerel, and sardines contain higher amounts of the omega-3 fatty acids which can be very helpful in curtailing the abnormal immune response associated with the disease and can quell the high amounts of pro-inflammatory chemicals produced as a consequence of this disease. The omega-3 family of fats can reduce inflammation, swelling, excessive blood flow, and decrease the enzymic destruction of joint structures that are characteristic of rheumatoid arthritis. These fats can also encourage tissue healing and repair following any damage from free radicals. The results of this study clearly indicate the role diet has upon the prevention of disease, even the more serious types of disease such as rheumatoid arthritis. “Fatty fish may help prevent rheumatoid arthritis,” CNN web site, August 12, 2013; http://thechart.blogs.cnn.com/2013/08/12/eating-fatty-fish-may-help-prevent-rheumatoid-arthritis/, last accessed September 10, 2013. Wolk, A., et al.,“Long-term intake of dietary long-chain n-3 polyunsaturated fatty acids and risk of rheumatoid arthritis: a prospective cohort study of women,”Ann RheumDis.